Read in the paper about how the interning – same as working for free – business is spreading. I thought it was merely for the hopefuls in creative jobs, but it seems to have grown to High Street clothes shops. Yes, of course I’d love to flog t-shirts all day long and not be paid! I can see how it began, and I can also see how someone saw how this could be used to line their own pockets, because we are all desperate to be part of something. Right now I’m only my own intern, but I argue with myself every week about this. Years ago I did other unpaid work, but it was called volunteering, and was mostly once a week in the school library. At least there was a library. And books. And I was needed/wanted for several years. I liked the access to unlimited books, and getting out of the house. And when the author visits began, meeting authors. Discovering they actually shop in Tesco, like normal people. So what to do once that ended? I sold myself to a bookshop, that’s what. I didn’t mind doing things for free. I chose what to be involved in, and it meant much more author contact. There was some writing/blogging involved, and eventually a young readers’ review group. I watched the part-time employees come and go, telling myself it was different for me, because I wasn’t being paid. But eventually I got pushed out, the same as the employees. Because I am under the impression they weren’t ever sacked. They chose to leave. And so did I. Having witnessed what was said about them afterwards, I determined to get in there first, so wrote a blog post about some of it. Only to get it out there, dated in cyber space. I didn’t mention names. But my ‘ex-non-employers’ read it and were not pleased. I’m just amazed that two weeks after such a falling out they were still reading Bookwitch. I must be better than I thought. I have no idea if they spoke about me after. Doesn’t matter. For years I had to explain to publishers and publicists that there was a ‘situation’ and in many cases this didn’t seem to surprise them. You have to tread carefully after this kind of thing, but I’d say I made more friends because of it, rather than losing them. Because I wasn’t alone. Authors were bullied. Publishers’ reps were bullied, and publicists. Someone totally un-initiated regarding this reported what was being said at Hay (I think). That helped make me feel a lot better. I mean, I knew I was no more horrible a person than average, but this kind of blowing hot and cold bullying got to me. So money had nothing to do with it. Means I never got paid, but it also meant it was quick to walk away from. What a lot of hugs! OK, so Hugless Douglas spends most of this book, We Love You, Hugless Douglas just hugging a bit, but mostly wanting a best friend. He is being a best friend, but doesn’t quite grasp what that means. 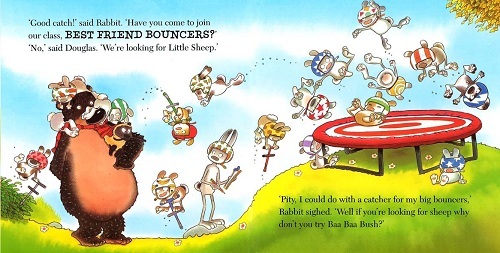 But it’s a walk in the woods with Flossie the sheep, and they encounter a lot of animals in their search for Flossie’s friend. 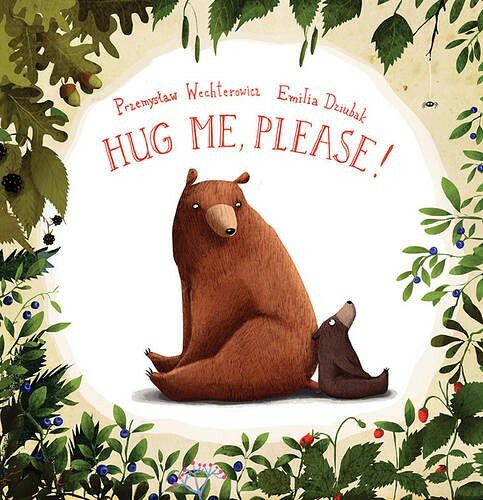 And it’s a walk in the woods for Little Bear and Daddy Bear in Hug Me, Please by Przemysław Wechterowicz and Emilia Dziubak too. Eating some honey gets Little Bear in the mood for hugging people. Well, animals. So they walk along, finding their intended huggees, and hugging them. Usually willingly, but some recipients are less keen on being bearhandled by what is a very large bear, even if it’s Little Bear. But they mean well. There is no eating of anyone, especially since they make the wolf miss the girl in red. Even the hunter gets a hug, since ‘it would be rude not to’ according to Daddy Bear. Lovely. And both books so very huggy. 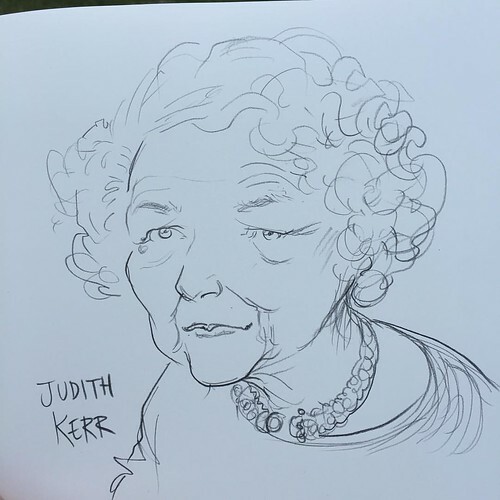 It was nice to find myself in the company of Chris Riddell* and Judith Kerr for breakfast yesterday. Not for real, and it’s not as we were all in Hay or anything, but these two lovely people had dragged themselves into a radio studio ‘early’ on a Sunday morning to share their thoughts about Manchester and Hitler and whether to keep the truth from children. The downside to that, as Judith said, is that children think anyway and come up with the oddest ideas. So Hitler wasn’t actually hiding behind the hanging decoration in the toilet. But she sort of believed he might be. And Chris mentioned that his immediate reaction on hearing the Manchester news was to think of his daughter, recently graduated from University there. It’s how we function; we grab something close to ourselves. In the Guardian Review we could read an extract from Philip Pullman’s Book of Dust. It didn’t take more than a few sentences and I was back in Lyra’s world. I already like Malcolm and his suspicious mind. 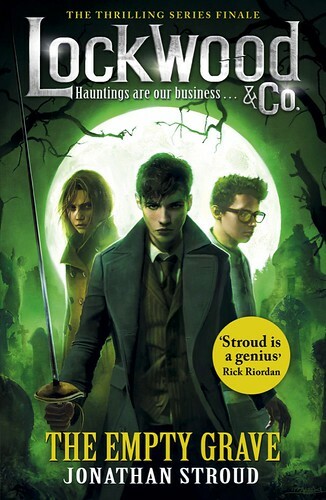 Another book to look forward to is Jonathan Stroud’s last Lockwood – The Empty Grave – which had a cover reveal this week. I tend to sneer a bit at reveals like this, but I found myself quite taken with it. Lovely to see George at long last. And I’d say that whereas an empty grave could be seen as a positive thing, I don’t think we should have such sweet expectations here (because where is the corpse?). Awards are good. Especially when given to the right people for the right books. Some favourites of mine have recently managed this. Simon Mason was awarded Best Crime Novel for Young Adults at CrimeFest for Kid Got Shot. Robin Stevens got the award for Best Crime Novel for Children. I’m simply pleased that the younger books are getting attention like this. Adrian McKinty won the Edgar for Rain Dogs, which is no minor thing, and is well deserved. He seems quite pleased, judging by this blog post. At home in Australia minding the children, Adrian sent his wife to receive the prize. But enough. 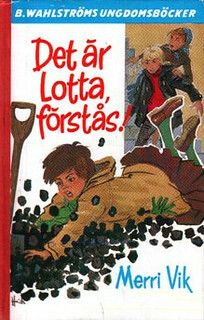 The Retired Children’s Librarian frowned upon the books from publisher B Wahlström in general. I can’t recall what she thought about the Lotta books by Merri Vik in particular, though. Among children the books were popular, and to some extent they did what the Retired Children’s Librarian said, which is they were cheap enough that they could be pocket money books. I believe we all bought some, and then we borrowed from each other. You couldn’t really borrow from the library, for the above reason. They were quick reads, so most of us went through a lot of Lotta books, and then there was Nancy Drew and the Hardy boys and all the rest. 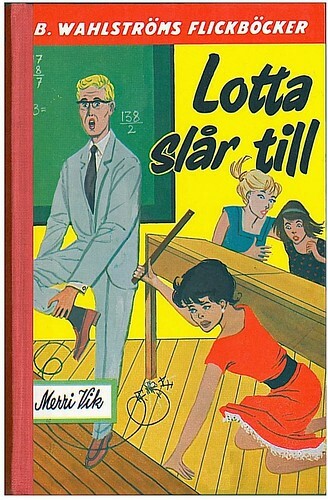 Lotta was 13 to begin with, a messy and forgetful but sweet natured girl, who often ended up in trouble. And then it – obviously – ended up all right. Likeable, but samey, which is why I have no idea which ones I read or how many. There is one I think of several times a year, however. I think of it every time I pack a suitcase; my own, the Resident IT Consultant’s, and occasionally Daughter’s, when she’s got ‘complicated’ packing to do. It’s because Lotta once accidentally upended her sister’s already packed suitcase, and was forced to stay and repack it, despite saying she had a boy waiting for her outside. Apparently at that moment she was suddenly able to visualise her mother’s packing technique, having watched her pack for years. So every little thing fits in beautifully, and she even folds the ironed dresses (this was a long time ago) to check that they will go in all right. And the flabber-ghasted sister realises her hopeless sibling has done a perfect job, and also that the boy was actually waiting for her all this time. That, dear reader, is what goes through my mind every time I pack. Literary, or what? Phil Earle has a son called Stanley. 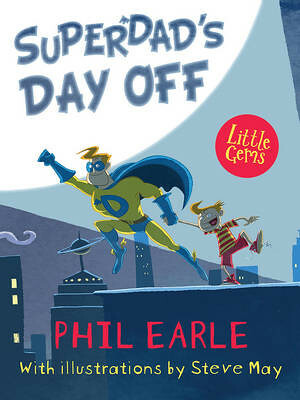 This Little Gem is about a boy called Stanley, who has a Superhero dad (so I can only assume Dynamo Dan is based on Phil himself…). The problem is that after a full week of Superdad deeds, dad is rather tired. Will he fall asleep in the park? Stanley needs to make sure his dad gets some rest, but he also wants to have fun in the park. So when the world needs Dynamo Dan’s services, Stanley can’t let his poor dad spring into action. And if not dad, then maybe Stanley can do it? He can. Stanley is your man if you have a panther up a tree or your house fills up with water from a leak somewhere. Dad gets enough rest so that when he’s really needed, he can join forces with his super son; Dynamo Dan and Super Stan. I’m with Bali Rai. It’s a disgrace the way people in our own country suffer hardship, with nowhere to live, or not enough food. 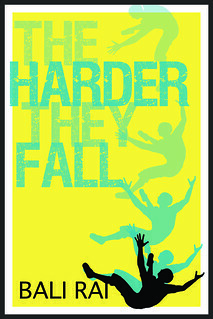 Bali had some figures for the rise in food banks, and as he points out in the ‘about’ bit of his new book The Harder They Fall, you are not poor because you don’t work or because you are lazy. Poor people are also people, just like the rest of us. Bali’s book for Barrington Stoke is about one such boy. Jacob and his mum need to use the local food bank, and this makes Jacob angry and he feels ashamed. This in turn means he’s unpleasant at school and often gets into trouble and is frequently expelled from the schools he has attended. But now he meets Cal, who describes himself as a friendless geek. Someone who volunteers at the food bank, so witnesses Jacob’s shame. Along with Freya, the girl he fancies, Cal tries to befriend Jacob, but this is no easy task. This book is about poverty, bullying, lack of trust, and about always being hungry. And it’s not your fault. We could do with more books on how – badly – we treat our fellow human beings in this country. 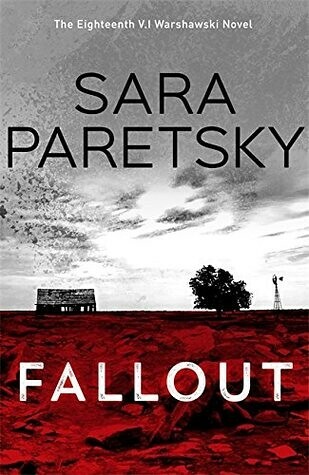 In her new novel Fallout Sara Paretsky goes home to Kansas. She lets V I do her detecting in her own old home town of Lawrence, even if she does rearrange the place a little to make it fit the plot. Sara’s father features for a second or so, and apparently she based the story on something from his work past. Fallout proves the theory that writers generally do better when they write about a place they know well, so it was a good move to send V I to Kansas. I’m not sure, but I wonder if this was the most Chicago-free of all the Warshawski novels. Anyway, they do things differently down there, and before long the whole of Lawrence knows exactly what V I has come for (to find two people who have vanished from Chicago), and they seem to keep track of her wherever she goes. They literally are. And Fallout is precisely what the story is about, in more ways than one. As well as mentioning NCIS several times, Sara goes a bit DiNozzo with her clues, and V I makes a Faraday cage! V I’s missing pair are really only the catalyst of what’s going on in Lawrence, and the crime takes us in a rather worrying direction. It’s feels more generally political than has been the case in the past, and that’s despite the book having been written before the Presidential election. The plot is kinder than they have been, or do I mean less violent? Not that V I is muscle before brains, but the most menacing thing is the way everyone ‘knows’ everything. It can get quite claustrophobic when you have no privacy in your detecting. Or so I imagine. I obviously wouldn’t know. But there are also some very promising local characters, understandably different from the inhabitants of Chicago. I loved this, as long as I don’t have to go down into Doris McKinnon’s cellar.